Let’s clear up confusion relating to Monsanto’s Roundup (active ingredient glyphosate). According to the German journal Ithaka, every single urine sample collected from city dwellers around Berlin tested positive for glyphosate, with values ranging from 0.5 to 2 nanograms per milliliter (ng/ml) – that’s between five and 20 times the permissible upper limit for glyphosate in German drinking water, which is set at 0.1 ng/ml. In the present study, the median glyphosate concentration in urine of people consuming predominantly organic food was significantly lower than in urine of people consuming conventional food. 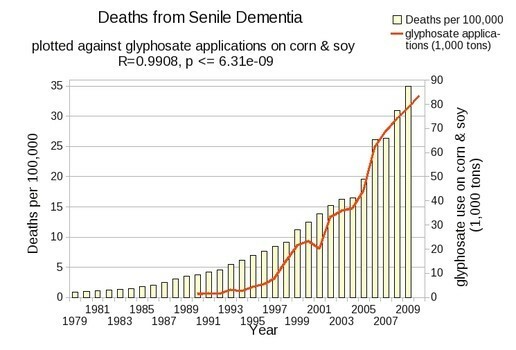 Thus, the prohibition of herbicide use in organic agriculture greatly reduces the intake of glyphosate…. 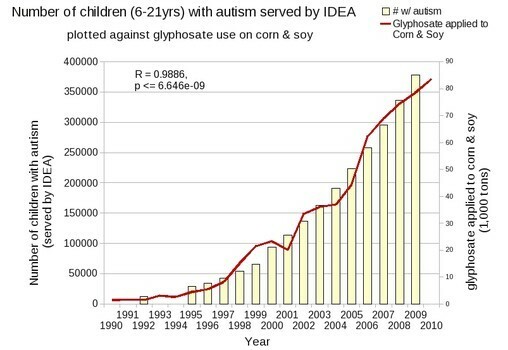 So while it is clearly advantageous for a person to eat organic food, preferably in a GMO-free country, even that doesn’t preclude one’s having some glyphosate in one’s system. How could that be? 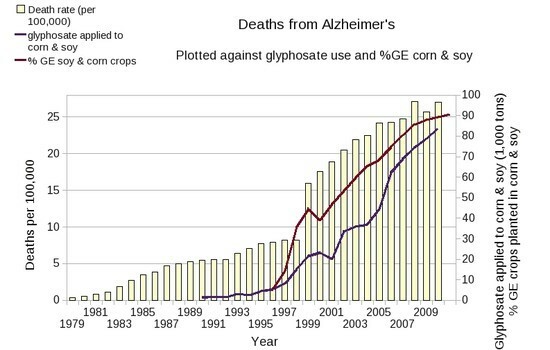 Glyphosate probably entered human populations over the past 10 years through its increasing presence in daily foods such as meat and dairy products, vegetable and fruit produce and grains products. Glyphosate-laced genetically modified Roundup soya which enters the animal food chain, is only one of the risk factors. ‘Spraying crops to death,’ as desiccation should be more aptly called, means that herbicides are being sprayed directly on the crops shortly before they are to be harvested to facilitate the harvest by uniformly killing off all living plants (including the crops) on the field. If crops cannot fully mature due to excessive rain, as was the case in the summer of 2011, herbicides are used to bring the crops to maturity by means of a ‘death-spray.’ The method facilitates the drying of the crops as well as removing all weeds for the next sowing period, and has become common for the harvest of potatoes, cereals, canola and pulses. For potatoes, spraying herbicides on the field immediately before harvest (2.5 l / ha), hardens the skin and reduces its susceptibility to late blight and germination, which improved the potatoes shelf life. Active compounds of the herbicide directly enter the potato through the leaves; however, decomposition of the poison takes place in the body of the consumer. stamped on their forehead so that the rest of us could be forewarned when dealing with them. OK, OK, I’ll stop being surly and get back to the topic. Grow your own food, exceeding organic standards and, following the examples set at Findhorn and Perelandra, work with the nature intelligences so that the food is tuned to health for your body. Water your garden with well water that has not been contaminated by agricultural and industrial runoffs. Again, if you can afford it, vote with your money, buying organic and non-GMO. The business world will catch on some century. Stop watching standard TV broadcasting and advertising, these likely rot your brain more quickly than glyphosate. Some countries are catching on. Netherlands, Brazil, Sri Lanka, and El Salvador have either banned the use of glyphosate or are putting the finishing touches on their rulings. In the US, it gets worse and worse: it looks like the USDA is set to approve Dow Chemical’s GE (genetically engineered) seeds that are resistant to its herbicide, 2,4-D, one of the ingredients in Agent Orange. What can you expect from a country where successive administrations, including the current one, appoint Monsanto executives to high positions in the FDA (Food and Drug Administration) and USDA (US Department of Agriculture). 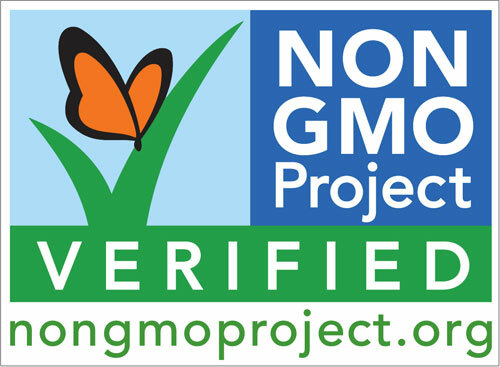 Possible Democratic Party presidential candidate Hillary Clinton is strongly in favor of GMOs and it’s difficult to imagine a Republican president standing in the way of any corporate activity, so as usual, it’s up to people. The so-called “leaders” are leading the lemmings off a cliff. People of privilege will always risk their complete destruction rather than surrender any material part of their advantage. Intellectual myopia, often called stupidity, is no doubt a reason. But the privileged also feel that their privileges, however egregious they may seem to others, are a solemn, basic, God-given right. This entry was posted in Environment and tagged Alzheimer's, autism, cancer, dementia, glyphosate, Parkinson's, Roundup by Thundering Heard. Bookmark the permalink. Absolutely shocking!!! Thanks, Mark, for keeping us posted!